In Australia, there are two major types of airspace: controlled, and uncontrolled. Controlled airspace in Australia is actively monitored and managed by air traffic controllers. To enter controlled airspace, an aircraft must first gain a clearance from an air traffic controller. Uncontrolled airspace has no supervision by air traffic control so no clearance is required to operate in uncontrolled airspace. The large majority of light aircraft and helicopters operate outside or underneath controlled airspace (for example, aircraft that operate at low levels over Sydney Harbour). In uncontrolled airspace, pilots are often not visible to air traffic control but must still follow visual flight rules or instrument flight rules. In uncontrolled airspace controllers do not provide separation but provide a Flight Information Service and Traffic Information Service to aircraft flying on instrument flight rules and on request to aircraft flying on visual flight rules. As well as being broken into controlled or uncontrolled airspace, Australian airspace is further divided into different classes, where internationally agreed rules for visual flight and instrument flying apply. 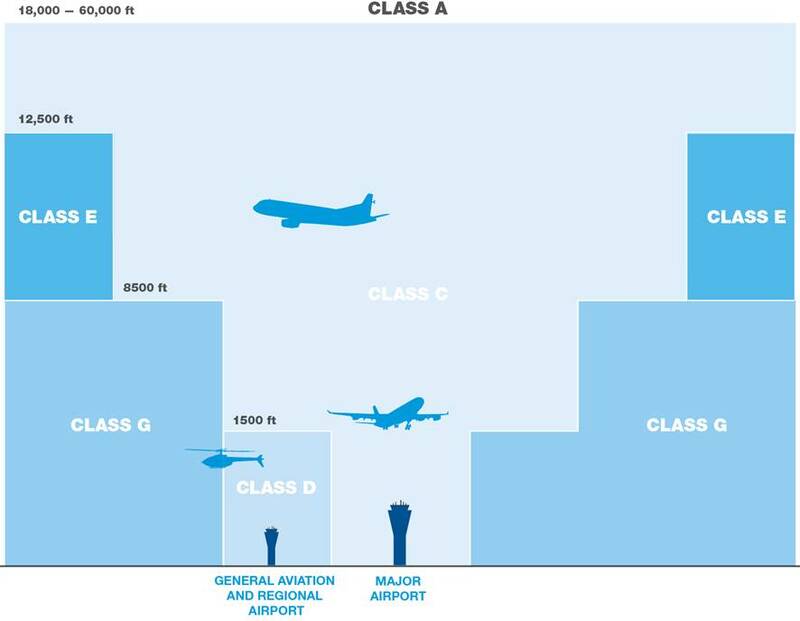 Depending on how far and how high an aircraft wants to fly, it will pass through different classes of airspace, in which different rules will apply to it. The diagram (below) represents the classes of airspace in Australia and how they connect and overlap. The level of service an aircraft receives from air traffic control and the classes of airspace in which it can fly, are determined by whether it is operating under visual flight rules (VFR) or instrument flight rules (IFR). Class A: This high-level en route controlled airspace is used predominately by commercial and passenger jets. Only IFR flights are permitted and they require an ATC clearance. All flights are provided with an air traffic control service and are positively separated from each other. Class C: This is the controlled airspace surrounding major airports. Both IFR and VFR flights are permitted and must communicate with air traffic control. IFR aircraft are positively separated from both IFR and VFR aircraft. VFR aircraft are provided traffic information on other VFR aircraft. Class D: This is the controlled airspace that surrounds general aviation and regional airports equipped with a control tower. All flights require ATC clearance. Class E: This mid-level en route controlled airspace is open to both IFR and VFR aircraft. IFR flights are required to communicate with ATC and must request ATC clearance. Class G: This airspace is uncontrolled. Both IFR and VFR aircraft are permitted and neither require ATC clearance. Note: At towered airports the class of airspace may change subject to the time of day. In restricted airspace, aircraft movements are reduced to those with certain specified permissions. CASA’s Office of Airspace Regulation is responsible for restricted airspace. Examples include airspace around military installations, high-density flying operations at an air show or other large public event. Restricted airspace may also be imposed by police for safety or security reasons near bushfires or major crime scenes.